Mary Josephine Lavin was born in East Walpole, Massachusetts to Irish immigrant parents. Her mother suffered from homesickness and eventually the family went to live in Ireland. Mary attended a convent school in Dublin before going on to study English and French at University College Dublin. In 1938, as a postgraduate student, she published her first short story, "Miss Holland," in the Dublin Magazine. Edward Plunkett, Lord Dunsany, became her literary mentor and wrote the preface to her first book, Tales from Bective Bridge (1943), a collection of 10 short stories. It was a critical success and won the James Tait Black Memorial Prize for fiction. That same year, Mary Lavin married William Walsh, a lawyer with whom she had three daughters and moved to Abbey Farm near Bective House in County Meath. Mary's first novel, The House in Clewe Street, was serialized in The Atlantic Monthly before being published in book form in 1945. 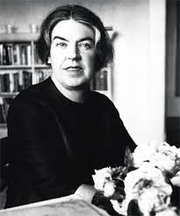 After her husband died in 1954, Lavin kept the family farm going as well as literary career, continuing to publish and win awards for her work, including the Katherine Mansfield Prize (1961) and Guggenheim Fellowships in 1959 and 1961. She became a pioneering female author in the traditionally male-dominated world of Irish letters, and her work often addressed feminist issues. She became the first writer-in-residence at the University of Connecticut in the late 1960s. In 1969, she remarried to Michael Scott, an old college friend and a former priest. In 1992, Mary Lavin was elected Saoi by the members of Aosdána, one of the highest honors in Irish culture. Her daughter Caroline Walsh became a writer and the literary editor of the Irish Times. Mary Lavin is currently considered a "single author." If one or more works are by a distinct, homonymous authors, go ahead and split the author. Mary Lavin is composed of 1 name.